Since testing positive in 1997, Giulio has been a staunch HIV advocate in his native Italy. Currently, he is an active member of the European AIDS Treatment Group in both the Policy Working Group and the European Community Advisory Board. He is also a member of the executive committee of the treatment as prevention PARTNER study and serves on the community advisory committee for the clinical trials network INSIGHT, which focuses on HIV treatment. Giulio is also an experienced journalist who has written for numerous Italian publications, including Delta, Pride and Gay.it. Grazie, Giulio, for all your hard work! When Brian was incarcerated in California in the late ’80s and early ’90s, he became a powerful advocate for people living with HIV even though he had not yet been diagnosed with the virus. After witnessing firsthand the stigma and discrimination that HIV-positive prisoners faced, he wanted to help ensure that they could live and die with dignity. In 1992, he and others orchestrated a medication strike—and later a hunger strike—at the California Medical Facility in Vacaville. Their tireless efforts led to the establishment of the first-ever federally funded hospice in any U.S. prison. Fast-forward to 2018. Brian is a peer educator for the “Know the Risks” program at the Elmira Correctional Facility in upstate New York and has educated thousands of incarcerated individuals on the basics of HIV, hepatitis C and other sexually transmitted infections (STIs). He is also a prolific painter who has dedicated his beautiful artwork to the many friends he has lost to AIDS complications over the years. He’s hoping to be paroled in February 2019. Marco, who left Mexico more than 20 years ago, has dedicated his work to amplifying the voices of immigrants, people living with HIV/AIDS and the LGBTQ community. He founded HIVenas Abiertas: A Network of Latinx Immigrant People Living with HIV, was a lead organizer with the coalition of Californians for HIV Criminalization Reform and served on the steering committee of the United States People Living with HIV (PLWH) Caucus. Marco is also a filmmaker whose 2015 documentary, El Canto del Colibri, explored the relationships between Latino immigrant fathers and their LGBTQ family members. This powerful work helped him win President Obama’s prestigious Champions of Change award. Yes, you can! Orbit is the epitome of a long-term survivor, having been diagnosed with HIV when it was initially called gay-related immune deficiency back in 1982. Thankfully, he has persisted for nearly 36 years and cofounded the Perceptions for People with Disabilities, a New York City–based organization that serves individuals living with HIV and/or disabilities. A devout Christian, Orbit is the leader of the Healing Hope AIDS Ministry at the Convent Avenue Baptist Church. He’s also an official United Nations nongovernmental organization HIV faith-based delegate. In 2018, he and his church were awarded the Choose Life Award from the National Black Leadership Commission on AIDS. Praise! “Neil the Wandmaker” has combined his passion for art with his LGBTQ and HIV/AIDS advocacy for nearly 30 years. His most recent venture is Bringing the Boys Home, a showcase at the Museum of Ventura County of four panels from the NAMES Project AIDS Memorial Quilt that were sewn by members of NAMES Project Ventura County in the 1990s. With his husband, Keith Coffman-Grey, Neil is also involved in the Gold Coast Archives, a collection of local LGBTI and HIV/AIDS historical documents and artifacts. Neil serves as public policy coordinator for the HIV Coalition of Ventura County, is active in local politics and writes fantasy novels. His boundless magical energy is an inspiration to his friends and fellow activists alike. Formerly a prevention team member, Robert is now the financial coordinator at Cempa Community Care, which provides primary and infectious disease care, mental health counseling, health maintenance, peer navigation and more for people living with and affected by HIV. When not crunching numbers for the organization, he spends his time spreading awareness about the virus. Known for his sassy personality and huge heart, Robert is currently working on programs for long-term survivors who are 50 and older, including planning for retirement—a milestone many in his community thought they might never reach. 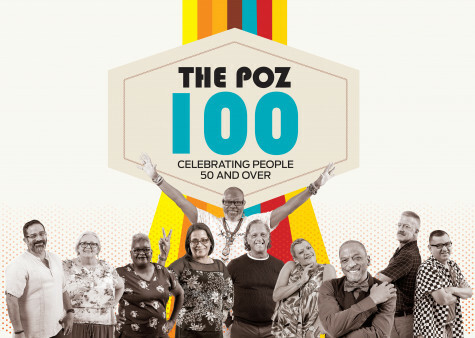 Over the past 20 years, his advocacy work has impacted the lives of people living with HIV from all walks of life and of all ages. After living with HIV for almost 30 years, Shelia disclosed her status to loved ones a year ago. But she’s been advocating on behalf of people living with HIV for the last three years. A natural leader with a knack for organizing, Shelia is currently cochair of the Dallas–Fort Worth regional chapter of the Positive Women’s Network–USA (PWN-USA), which organizes at the state level to further the group’s mission and advocacy agenda. She is also on the planning committee for the Grace Project National Conference for Women Living with HIV/AIDS, an annual event in Texas designed to support, educate and empower women with the virus. Last year, Shelia was arrested in Washington, DC, for protesting the repeal of the Affordable Care Act. This year, she was arrested for protesting Supreme Court nominee Brett Kavanaugh. Diagnosed with HIV in 1985, William is a member of the Capital District committee for New York State’s End the Epidemic campaign and an HIV peer educator for the Ellis Family Health Center. He has a long history as an HIV advocate. From 1994 to 2009, he was a member of the Northeastern New York Ryan White HIV Care Network, serving as cochair of both the steering and the community awareness committees. He has served on the community advisory board of the AIDS Treatment Center at Albany Medical Center since 1994. He has participated in AIDSWatch since 1998 and has also contributed to POZ. As a gay man living with HIV and struggling with mental illness and addiction, Mark wanted to help others living with such issues. To that end, in 2003, Mark, who has survived a suicide attempt as well as prostate cancer, founded Pink & Blues, a peer-run support group and safe space for LGBTQI people living with mental illness, substance use disorders and other health conditions, including HIV. In 1987, Mark was elected the founding president of the Pennsylvania Mental Health Consumers’ Association. Two years later, he was diagnosed HIV positive. In 2009, Mark was awarded a Consumer Leadership Voice Award by the Substance Abuse and Mental Health Service Administration for his work in the mental health field, including advocating for survivors of suicide attempts. Mark’s goal is to help eliminate the needless deaths by suicide and overdose that disproportionately affect LGBTQI people of all generations. Larry is program director at the Victory Program’s Boston Living Center, a nonprofit community and resource center that fosters the wellness of HIV-positive people through education, treatment information and supportive services. He first became involved with the organization as a member after years of struggling with addiction and incarceration and then started doing peer education in Boston’s public schools. Soon after, Larry found his calling in public advocacy, accepting a position at AIDS Action to work on policy. He has since spoken out in the office of every Massachusetts legislator, testified in front of Congress, attended AIDSWatch for more than 20 years and spoken at numerous state and national events on behalf of people struggling with addiction and HIV/AIDS. Yolanda has been fighting against HIV/AIDS and advocating for women living with the virus for over 25 years. She is a cofounding member of PWN-USA and currently serves as the secretary-treasurer for the group’s New York City chapter. For eight years, she worked with SMART University, helping self-identified women access HIV treatment, prevention, nutrition and health education services. Her work with high-risk groups across the city’s five boroughs has earned her numerous honors over the years, including the 2020 Leading Women’s Society Award from SisterLove in 2010. She was recently elected to the U.S. PLHIV Caucus, where she sits on the steering committee. She currently works at Iris House, where she’s described by colleagues as knowledgeable, honest and supportive. Yolanda finds sisterhood with women across every creed, color, borough and religion. Diagnosed in 1985, Reggie has dedicated his time to helping others living with HIV/AIDS for more than 40 years. A Vietnam veteran and member of Thrive SS, an organization of Black gay and bi men living with HIV who are striving for an undetectable viral load, Reggie also serves as the Atlanta Ryan White Planning Council’s second vice chair, on the Emory Community Advisory Treatment Clinical Trials Unit, as a community advisory board member of the Atlanta Legal Aid Society and as the chairman of the board of GACYE, an organization that empowers youth. And he’s the founder and CEO of POZ Military and Veterans USA–International. But that’s not all—he also founded the Georgia Association for Positive People, and Pozpreneurs, which assists people living with HIV in business endeavors. Diagnosed with HIV in 1993, Jace overcame a 20-year meth addiction to go on to earn his bachelor’s degree in human services at Montana State University in 2009 and become the secretary for Yellowstone AIDS Project. Since 2014, he has been a case manager in the HIV Services Program at RiverStone Health. He is also cochair of Montana’s HIV Planning Group and treasurer for Not in Our Town Billings, which fights for an inclusive community free of hate and intolerance. He is a member of Prime Timers, a social network for older gay men. Currently working on his master’s in public health, Jace also volunteers with AIDSpirit USA, a local support organization that also aids an orphanage in Uganda. Described by colleagues as having a heart of gold and going out of his way for his clients, Jace fights stigma by living as an openly HIV-positive gay man in rural Montana. His passions are food and HIV prevention.